is pleased to announce that we will be hosting a special holiday vending market events at Stuyvesant Mansion, a beautiful Landmarked and historic mansion. It’s part of it’s re-branding and modernizing effort being undertaken by the owners. With this beginning vendors event, we will be doing our part in helping to reintroduce the mansion to the public as a creative space. Would you like to join us in celebrating and our local institutions and building a strong community to support local artists and vendors? 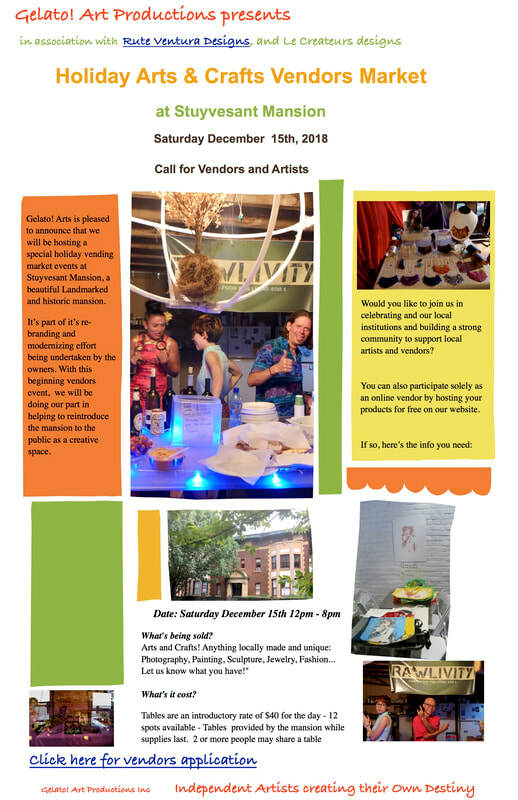 You can also participate solely as an online vendor by hosting your products for free on our Holiday Market website. Painting, Sculpture, Jewelry, Fashion... Let us know what you have!" 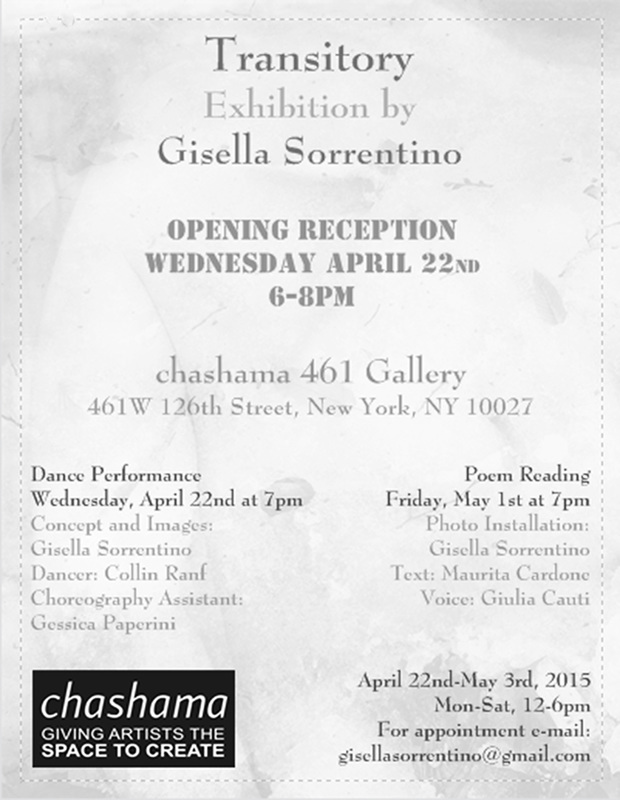 From April 22 through May 2, chashama Gallery 461 will host an exhibition of the photographic work by Gisella Sorrentino. which conflates the physical movements of her subjects with the environments that surround them. Ms. Sorrentino has a unique style by which the ‘body’ and the ‘space’ are equally her subject: their separate textures combining through her artfully unpremeditated double exposures. 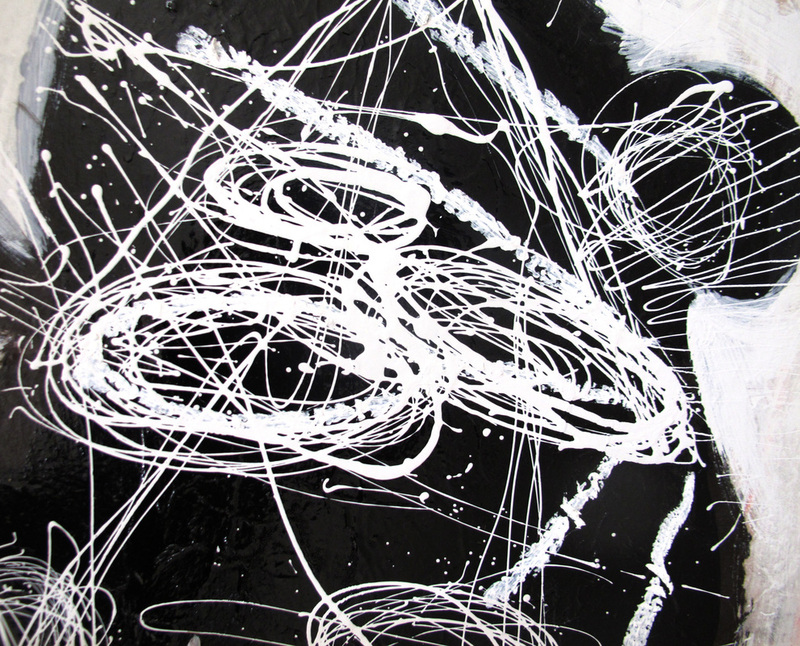 The result is a dynamic tension of various opposites ranging from nature- urban and body–mind to inner self–outside world. Each series of photographs visually captures fleeting glimpses of that dancer’s spontaneous emotional reaction to their individual environmental space. Transitory is a multimedia and multi-sensory installation. images will be projected onto a “Living Screen” - a semi-transparent fabric hung from the ceiling - for a dynamically fluid portal of light. The images will guide observers on a journey through the various stages of life, each represented as colors and textures of seasons. The goal is to transform the ancestral memory of each life-stage into an eternally refreshed, spring-like experience. On April 22 at 7pm, the exhibit’s opening will feature a live performance of dancer Collin Ranf improvising to images of the “Living Screen” and environmental sounds. On May 1st at 7pm, the exhibit’s closing will feature poem reading by Maurita Cardone. The exhibition is curated by Eleonora Calvelli and Alessandra Carbone. passing from one step of success to another, forming new wishes and seeing them gratified. Thank You to Everyone who came to our Gelato! Art Salon fundraisers on August 10th and 31st!!! There are some photos from those nights on the website that were taken of that night, Please visit them here. 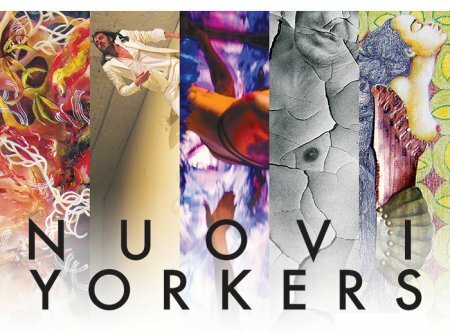 They are all Italians who are pursuing their dreams and doing art in New York. We have big changes coming up in 2015 that will make Gelato! Art Collective much more efficient and interactive. Our plan has always been to be the one stop you can come to and find all kinds of info on things that make artists lives happier, more productive and prosperous.And how we can all do business with each other and with the world at large. As our tag line says, one of our main goals will be to connect local artists and businesses, and 2015 will be the year to paint that picture clearly. We are still in the planning stages, so all we can truly say is that we will update you with the changes and news as it develops. However, one of the most important things occurring will be a redesigning of our website and partnerships with other businesses that we met during this last year who wish to work with us and grow with us. Thank you for your love and support and we look forward to many beautiful moments of art, love, and a prosperous year for all! The Walworth Loft, the space where Gelato! Art Salon began it's journey as an arts collective in 2009, is closing it's doors after 15 years as a community of local & international artists and as an art event space. 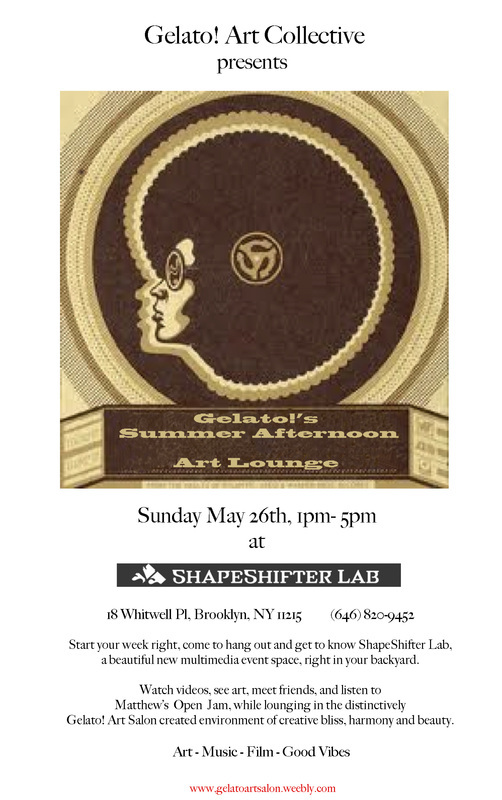 To celebrate the " End the Era" of the loft as an art/living space, Gelato! Art Salon will be hosting a couple of events ( August 10th & August 31st) to close out the space, all are welcome to participate in and celebrate the history of the space and of Our Collective. As Gelato! Art Collective is in our entrepreneurial stage, the events will double as a Gelato! Art Salon fundraisers for our future events and programs, and raise money to help Gary Campbell move and close out the space. Click here to Read More about dates and participation! 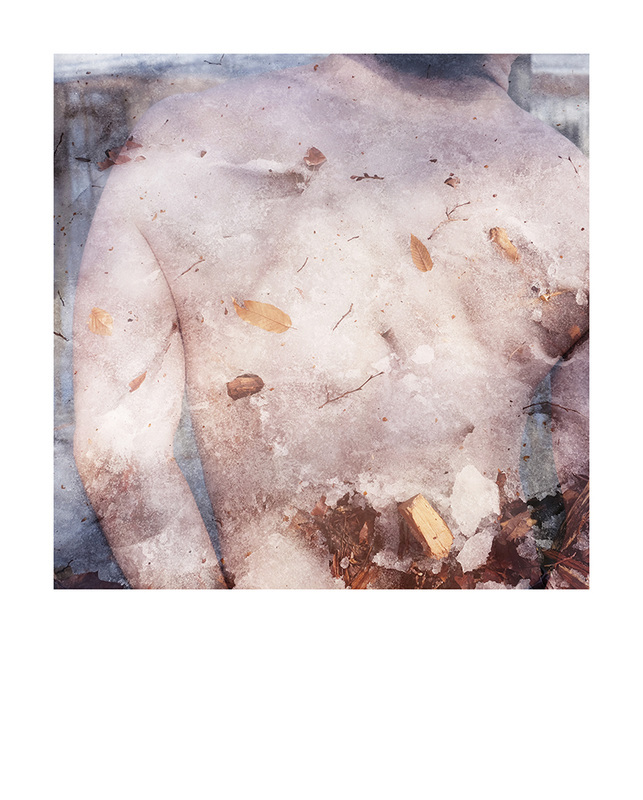 Gisella Sorrentino has another photography exhibition coming up July 31st - August 16th, 2014. 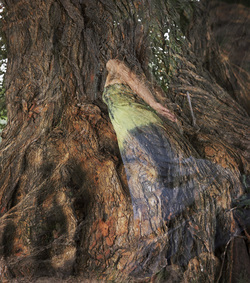 She will be part of the Exhibition AS|Orchard presented by Jill Conner of A S Artists Studios. @ 33 Orchard st Manhattan N. Y. Please come visit the group show. Maya Korn's project of photographing artists in their work spaces and continue's with her latest works including Garón Peterson, founder of the Gelato! Art Collective. Please visit Maya's website here at oneofuswhitechapel and scroll down past the Immersive art info see her photos and Garon's profile and his artworks. Maya and her collective have produced large immersive art festivals in the U.K. in Whitechapel. 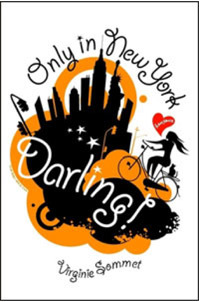 She is now producing one this weekend Friday March 28th and Sunday March 30th at St Paul’s Lutheran Church of Williamsburg, 334 S 5th St 11211in Williamsburg. Details on her the events Facebook page. He will exhibit a live painting performance featuring two extraordinary Goddesses, presenting their live sculpture installations, Heather Milburn channelling the Mother's Milk goddess and Pamela Schneider exploration of Lilith with a sci fi twist. Mother's Milk is a live sculpture and installation as a reminder of the importance of what gives our planet life. The necessity of nature and it's inherent feminine contributions. Paying tribute to the supernatural power of the goddess: the healing, the love, the beauty, the inspiration, the intuition, and the nurturing... All for means of creation. There will be 3 performances over Friday the 28th of March and Sunday the 30th of March. The slots run between: 7-8pm, 8:30-9:30pm and 10-11pm. Address: St Paul’s Lutheran Church of Williamsburg, 334 S 5th St 11211. The nearest subway is Marcy Ave JMZ.You can buy tickets here. You can also reserve tickets from oneofus.whitechapel@gmail.com that will require payment on the door. Tickets are $20 with a student discount rate of $15. In occasion of the performance "LAST CHANCE", Gisella Sorrentino will open her show "HE", a selection of her most recent work, on Friday April 4th from 6-8pm at The Secret Theatre in Long Island City, NY. The exhibition will be on view till April 25th. The male dancers in her photographs were invited to release their bodies and abandon them-self to their inner emotions. In Arturo (2011), the dancer improvises on feelings of oppression and suffocation while leaning against a wall in Brooklyn. In Collin and Nicola (2013), encircled by flowers, the dancers surrender to the sensual provocation of nature. In the photographs, their vulnerability stands as a metaphoric space in which we need to get lost in order to find ourselves again. 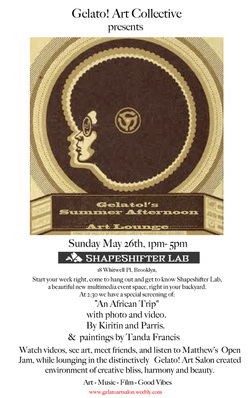 Sunday Afternoon Chill Out Art Lounge Party / Gift Shop Events! Just in time for your Holiday Shopping, or to give yourself a very special treat. As always, it's just a good reason to meet old friends, get introduced to new people, make art, watch video's and generally chill and have fun on a Sunday Afternoon before you go off to the park or elsewhere. We have the opportunity to create a vibrant yet intimate art lounge scene that can actually help to support artists and handicraft makers through marketing and selling. Let's grow together! More info coming soon on the details, or email us now to submit early. Gelato! 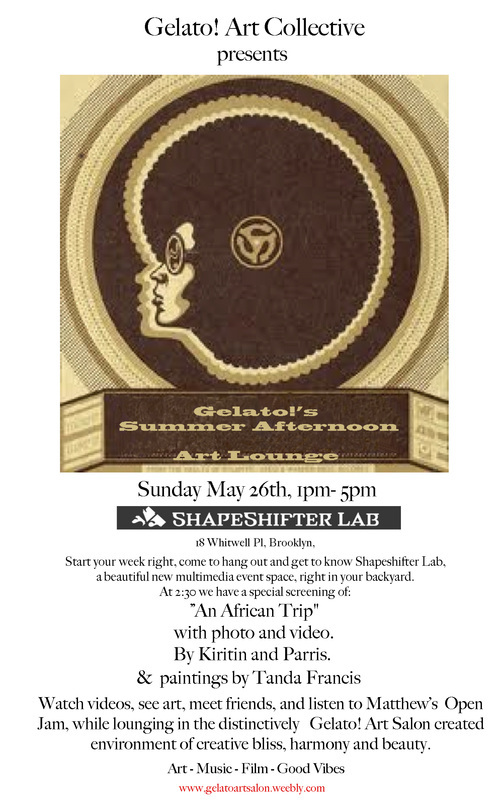 Art Salon and ShapeShifter Lab! J Fury hails from Syracuse, NY. His eclectic range of styles has packed many a dance floor over the last decade, from Buffalo to NYC. He appreciates the element of surprise. While his sets often include House, Drum & Bass, Dubstep, and New Wave, J Fury can just as easily end the night with a rhythmic down tempo lounge set spiced up with movie samples mixed throughout. He continues to play in NYC with a winter residency with Gelato! Art Salon. His mixes can be found on Youtube channel : wikkyj74." 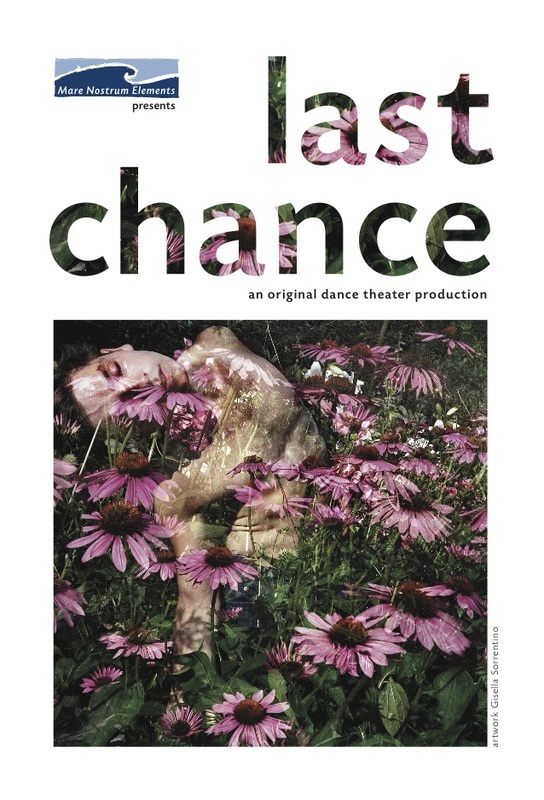 LAST CHANCE explores the moment in life where the concepts of Right vs. Wrong are disrupted. Expectations are dashed and what we project for our uncertain future is replaced by the reality that unfolds with time. To avoid missing Gelato! 's newsletter and to stayed tuned to special events, please find the message by checking your Promotional folder, then click and drag the message to the Primary folder, and confirm with Gmail to save this setting. A yellow box will appear asking, “Do this for future messages?”. Make sure to click the “Yes” link to train Gmail to send all email from us to your Primary tab. Gelato! Radio Podcast has arrived! Gelato! Art Salon created environment of creative bliss, harmony and beauty. Still from Kiritin and Parris' "An African Trip"
Welcome to Gelato! Art Salon Radio, the official radio station of the Gelato! Art Collective based in Brooklyn New York, with your host Garón Peterson. It's our first one, but we are hard at work on some more, so stay tuned. More info on future Shows coming up! Please let us know if the podcast plays okay, so we can correct anything we need to on ourend, and we encourage any and all comments on what can make the show, or website a better experience for you. 2nd song Memory - Table / vs Ludavico Einaldi - Buddha Bar VI. treat yourself and your friends to an exciting evening of Dance and Music! Dance Performance at it's best! DISONNECT: a journey into the depths of the human psyche told through dance. for each other while searching for their own identities in the cold desolation of the modern age. Through performance, Codice Rosso aims to pose a number of questions: What do we really know about ourselves? What happens when we can no longer find each other? In a world that can feel so cold and dark, how do we find the light in other people? we use our immensely diverse technical backgrounds and personal stories to answer these questions through a rather unique, multi-cultural lens. Putting the textbook explanation aside: it's an hour-long wild ride filled with really cool music and some extraordinary movement! We have a story to share, and we want to take you along for the journey. Don't miss out on this one-of-a-kind evening of dance, drama, and artistic upheaval!" Friday, June 28th @ 7:30 p.m.
Gelato! 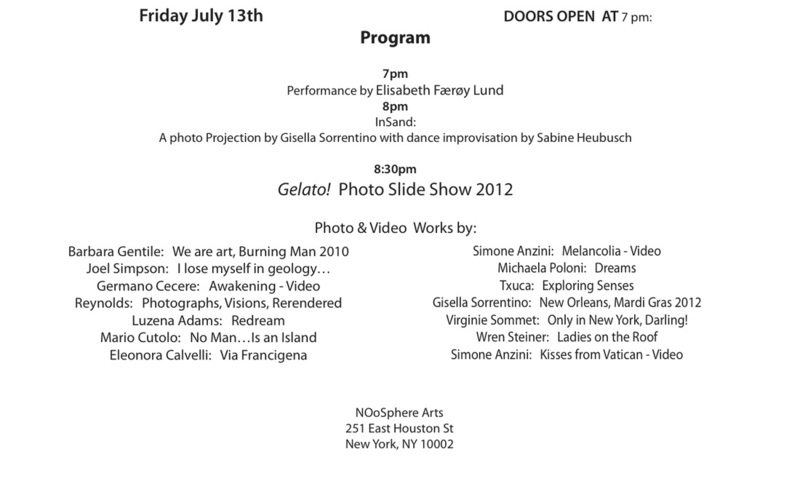 Event Presentation 2013 from Gelato!Art Salon on Vimeo. Please enjoy the slide show of photos from Parris Jaru Miwa Alex Sunday event below. PARRIS JARU hails from Jamaica, and is one of those rare dedicated young artists who solely supports himself with his paintings. Starting by selling his works on the streets of SOHO, he has since acquired a growing list of collectors and just recently finished his biggest commission to date, a piece sold in the 5 figure range. MIWA - ALEX HAIR SALON. Now is your chance to acquire one of his most recent beautiful works for your home, business or personal collection before he heads of to Africa for the Spring. MIWA IKEGAMI, the founder of the salon, was an accomplished artist herself and supported many artists with valuable wall space and exhibitions at her spacious hair salon on 22nd street between Broadway and Park Ave South. The show opened Saturday November 17th and closes Sunday, January 6th. 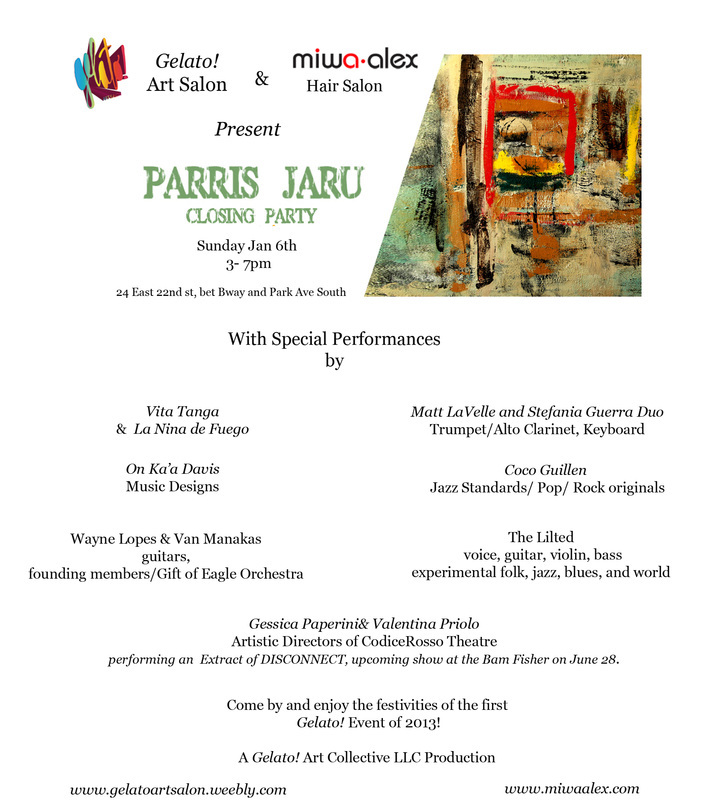 PARRIS JARU will be presenting brand new paintings for sale at the exclusive venue of the MIWA - ALEX HAIR SALON. Now is your chance to acquire one of his most recent beautiful works for your home, business or personal collection. MIWA, the founder of the salon, was an accomplished artist herself and supported many artists with valuable wall space and exhibitions at her spacious hair salon on 22nd street between Broadway and Park Ave South. The show opens this Saturday November 17th and runs until December 17th. GELATO! PHOTO SLIDE SHOW NEWS LINK or the link here- DEADLINE has been extended to FRIDAY JULY 6th! Gisella Sorrentino from "Bodies in Space"
Gisella Sorrentino in her work is a 'tireless experimenter, setting no limit to the wonders that photography has on her curious soul, visionary, but also very strict. The works selected for this occasion therefore reflect a specific stage of her research, a phase, that is firmly guided by the real, both from a technical standpoint (the use of analog and natural light) and that of the theme of her pictures (the physicality of the meeting of the human body and the environment). The shots of Bodies in Space, explains the photographer, are born from the meeting and by the 'spontaneous interaction of two main elements: the body and the emotional space of the dancer, and the physical space in which the performer is immersed, and that in turn inspires the movement. 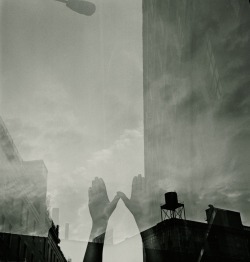 A third, but crucial, element of interaction, which is also completely spontaneous, it is purely mechanical: at each step, it is superimposed - through a double exposure - following the first, portraying the 'physical environment, this time without the human element. I've been selected to represent my work in the final Art Alumni Exhibition in the 75th Anniversary of my high school, The High School of Art & Design. The beautiful old school building where I spent 4 incredible years as a high school student learning about art and life is scheduled to be demolished this summer, to make way for the brand new, ugly ill designed building next door that is called progress these days. I'm showing on of the new pieces from my Goddess Returns Series. So, if you know the school, or went there of if you're in the area come by and check the show on Thursday, Friday or Saturday, it'll be up about 2 weeks I think. Love to All and keep the Art Alive! Be a part of a Roving Pageant at the Figment Arts Festival on Governor's Island. Fly with the most beautiful birds in the world, the Quetzal as Quetzalcoatl leads the way to our Community Vision Circle. 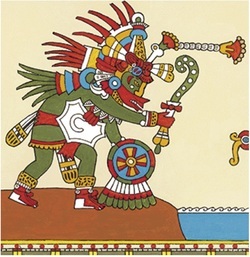 Then join us for a very special ceremony with dance group Cetiliztli... Nauhcampa Quetzalcoatl in Ixachitlan who will open their circle to our group with a friendship dance of Quetzalcoatl. Community Vision Circle lead by Elliot C. Murray and Caroline Meiselbach with Garon Peterson Shamanic ritual/ art performance and the Hottie Tati paintng your body. I welcome my family and friends for this very special celebration at Figment on Governor's Island. CODICE ROSSO THEATRE in ReVision Season 3! This Month ReVision is a part of the LIC Arts Open Festival! ReVision presented by Forward Motion Theater is a monthly series where live media and digital art are integral to the performing arts. 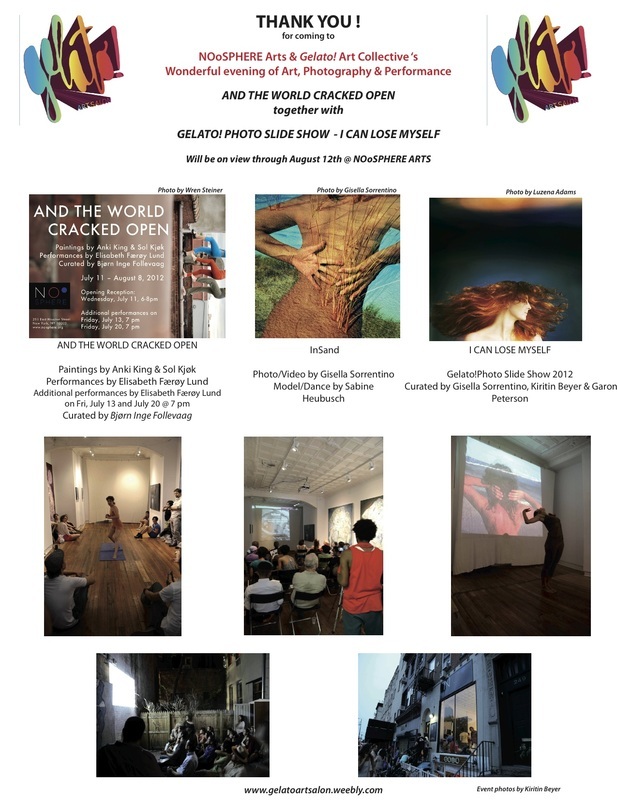 The evening features independent works by featured artists incorporating live mix video, film, dance, spoken word, puppetry, music, and costume. Gisella Sorrentino has been very busy lately, as have many of Gelato! 's Art Collectives artists and friends. She's overhauled her new website, and started a blog about her photography adventures! 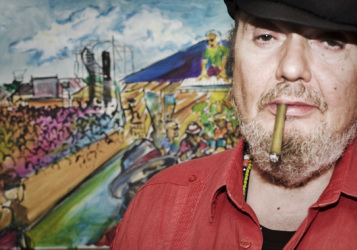 Just back from a trip to New Orleans, she sat down and spoke to the legendary blues musician Dr John, visited the popular swing dance scene near Marigny, and got up at 6am to cover Mardi Gras Day. "If you feel to swing, New Orleans is the place! Almost every night there is a dance session. 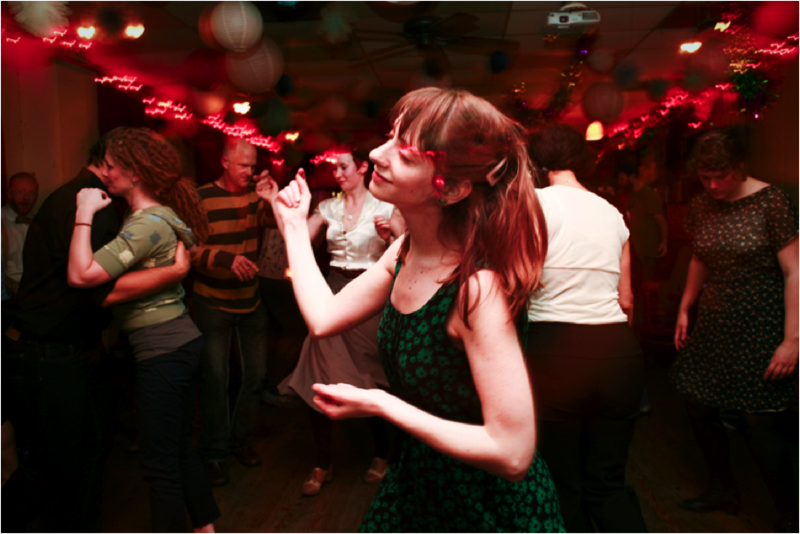 Even if you are not a swing dancer it’s amusing to tune in and follow the rhythm of great local jazz bands. Beautiful dressed girls and guys, styled like the 30s with some contemporary funk touch, are floating in small smoky jazz club with low lights. 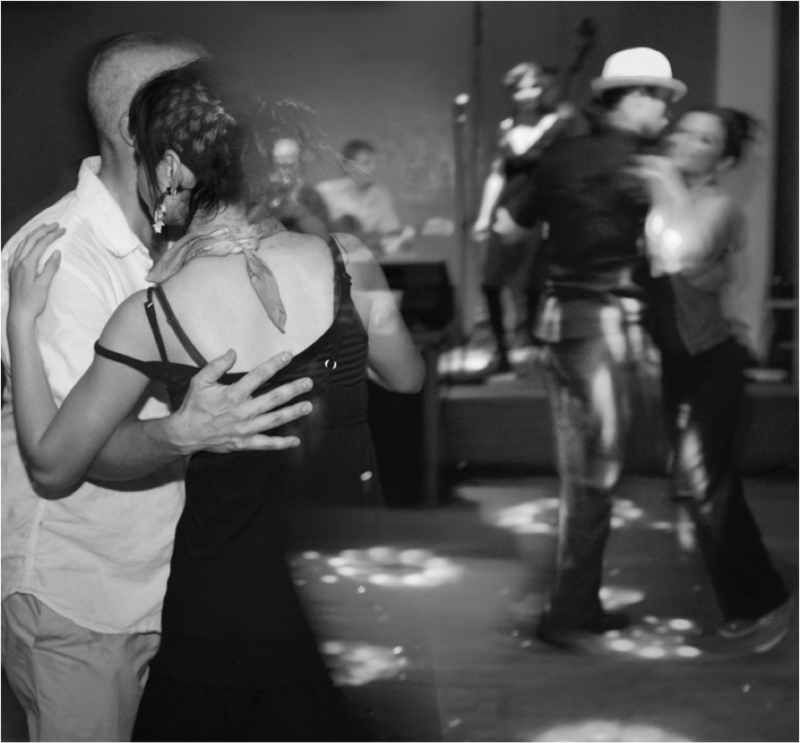 If you are willing to learn swing dance, there are..." To read more please go to Gisella's blog! Virginie Sommet is a work of Art by herself. This passionate woman escaped the BCBG "Ghetto" (Preppy Ghetto) where she grew up to be able to truly exist. 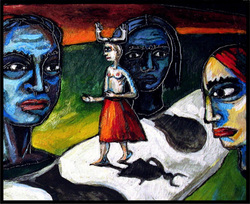 Originally from Normandy, graced with multiple talents, Ms Sommet chose art to express her quest of a different society. Utopia is good. Interview. Where does your engagement come from? Your desire to be Elsewhere ? I think that my engagement is coming from the fact I am coming from a ghetto, the one of the Catholic practitioners and bourgeoisie. In my child’s bedroom it was 31 Fahrenheit. I was not allowed to watch TV. So when I escaped to Paris at 19 years old it was a shock. I realized that life did not have to be “navy blue” and “bottle green”(“Brook Brothers/Wasp/Preppy’s style”) as I knew it until then. Lisieux , was populated by Caucasians only. There was no other ethnic group. I was feeling closed in. Gelato! Friends @ THE FOUNTAIN ART FAIR,Muse CPMI and ETHAN COHEN FINE ARTS!! MeliSsa MaRino- FOUNTAIN ART FAIR LAUNCH PARTY FRIDAY NIGHT. CATCH ME THERE ALL WEEKEND LONG. Fountain’s 7th annual New York exhibition commences in less than a week at the 69th Regiment Armory, location of the original 1913 Armory Show! 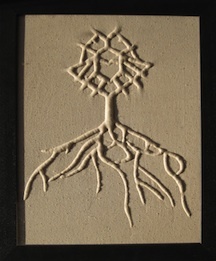 March 9th, 10th and 11th I will have the attached piece at Fountain Art Fair with Art for Progress Gallery. 29th Lexington Ave @ 25th Street, NY. After 7p the three days, they are followed by performances and party times. 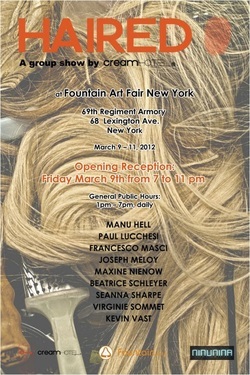 Creamhotel® is excited to announce its participation to Fountain Art Fair New York with the exhibition project Haired, successfully presented in Miami during Art Basel 2011 at LMNT Gallery. Haired is a multimedia group show developed around the theme of hair. The exhibition explores hair as a concept: a synonym of identity; the most malleable part of the body; a tool available for creativity and a medium for artistic practice. Hair defines facial, physical, psychological, social and cultural expression. It’s a channel through which the personal and collective self, find its way out into the world. 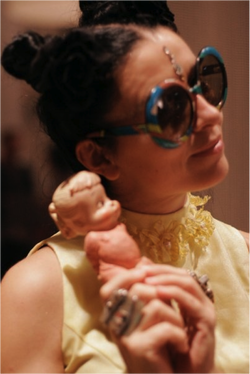 Through installations, photography, sculpture, painting and performance, artists explore the concept of hair in multiple ways and through different angles, highlighting how hair serves as a marker of personality, social status, age, racial and cultural identification, political and spiritual beliefs, gender and sexual orientation. Hair expresses people’s identity to the extent that different hairstyles represent a person’s different phases in life. Ultimately, Haired wants to present a fresh outlook on societies, cultures, trends and lifestyles through an unusual point of view. Creamhotel will create a brand new site-specific installation for a 500 sqf. booth within Fountain Art Fair’s amazing new location, the landmark 69th Regiment Armory in the Gramercy Park area of New York. We will get inspired by the genuine, fresh creativity and playful artistry that distinguishes Fountain Art Fair. All classes are two hours long. Each course meets for ten classes. Please go the the Community Forum Page for more info! and it's all mine! I will be showing work from my "Universe" series that I started while at the Mano Y Mente Artist Residency in New Mexico. I am pleased and honoured to be included as a Chashama's artist. A formal invitation is in the works. It is going to be a fantastic show, especially if I see you there! Riding on the Rails radio - Important mainly because of the people in the conversation. slide show, foot, drinks, music, artist talk and more. 1095 Dean Street Bedford Ave and Dean St.
A splendid display of interactive art and wearable technology! I will be there, hope to see you there. 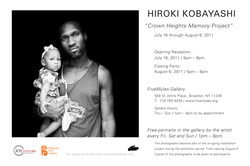 We are having a closing party for my solo exhibition "Crown Heights Memory Project" this Saturday Aug 6th 5-8pm at Fivemyles Gallery in Brooklyn. I am showing the installation of new photographs that I shot the visitors during the exhibition period. 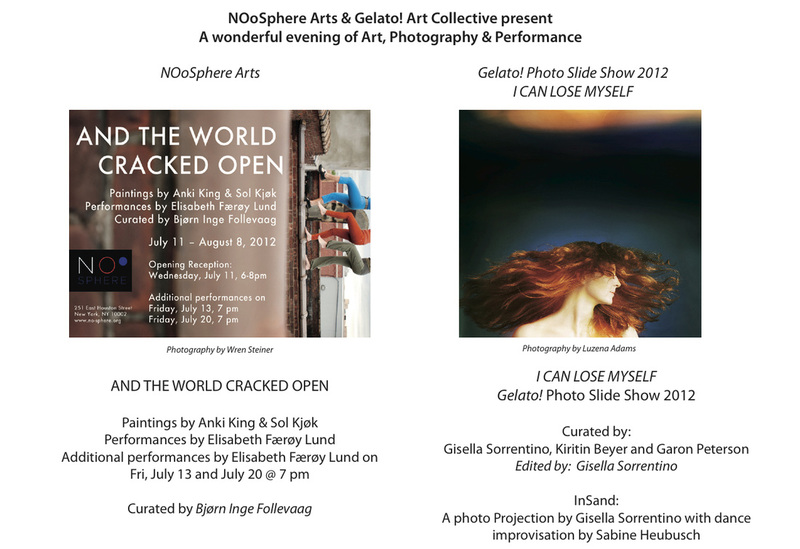 Also my friend & artist Erin Gleason is having a performance opening at the same time. Please come to join us. Special thanks to Fivemyles Gallery, Brooklyn Arts Council, NYC Department of Cultural Affair, Industria Super Studios, Little Fish Studio for kindly support. I'm back in New York after a long trip in Europe and I would like to update you about the exhibition in Budelsdorf (Kiel,Germany). NordArt was a beautiful discovery: the show is hosting more two hundreds artists in an old and huge ex-foundry surrounded with a wonderful scuplture park. The quality of the art works (installation, scuplture, paintings, photography, video, art performances) was very high and the art community very generous and warm. We had a great opening day. Almost 100 artists and more than 2000 guests came to celebrate this day with us. The sun was shining and we had music, performances and catering in the park. Thank you for visiting Gelato! 's new blog. Next Gelato! Photo Slide Show will be held at s.t. foto libreria galleria in Rome on July 8th, 2010. Deadline submission is June 20th at midnight. Gelato! Slide Show Preview will be presented at Brooklyn Movie Lab in Brooklyn NY on June 26th, 2010. Deadline for preview is also June 20th at midnight. Download the form below to submit your work! If through a friend, please write their name in the comment field! Please write in capital letters what you are submitting. e.g NEWS or SUBMISSION for RECENT ART WORK PAGE, then write the rest of your comment. Thank You!